Film Review: "Side Effects" (2013). "One pill can change your life." Side Effects does exactly that. This psychological thriller film directed by Steven Soderbergh from a screenplay written by Scott Z. Burns. The film concerns the ramifications of an event following a young woman being prescribed antidepressant drugs, in particular the fictional new drug Ablixa (alipazone). To promote the movie, a website for Ablixa was created, and Jude Law answered questions by email. Up to the year 2005, there have been around 68 documented cases of homicidal sleepwalking. This was to become the subject and subtext for Scott Z. Burns' script. With the original title The Bitter Pill, this film was to be director Steven Soderbergh's last effort in the director's chair. For casting, Soderbergh originally considered casting Lindsay Lohan for the role of Emily and he auditioned her three times. However, producers felt that her ongoing legal issues would disrupt the production process. Afterwards, Emily Blunt, Olivia Wilde, Imogen Poots, Alice Eve, Amanda Seyfried and Michelle Williams were considered for the lead role. Then Blake Lively was cast, but the production company that was funding the movie dropped out after learning of her casting. She was eventually replaced by Rooney Mara, who dropped out of Zero Dark Thirty (2013). Justin Timberlake was considered for the role that went to Channing Tatum. The film reunites Catherine Zeta-Jones, Channing Tatum and Jude Law with Soderbergh, making it their third collaboration for the formers and the second collaboration for the latter. Soderbergh claimed that one his biggest influences making the movie was the work of Adrian Lyne, especially Fatal Attraction (1987). Principal photography started in April 2012 in New York City. The film stars Jude Law, Rooney Mara, Catherine Zeta-Jones, and Channing Tatum. The cast gave riveting performances, each one displaying psychological depth and turns left, right and centre. Mara brings a particularly seductive complexity to the role and Zeta-Jones shines once again in her second Soderbergh role. 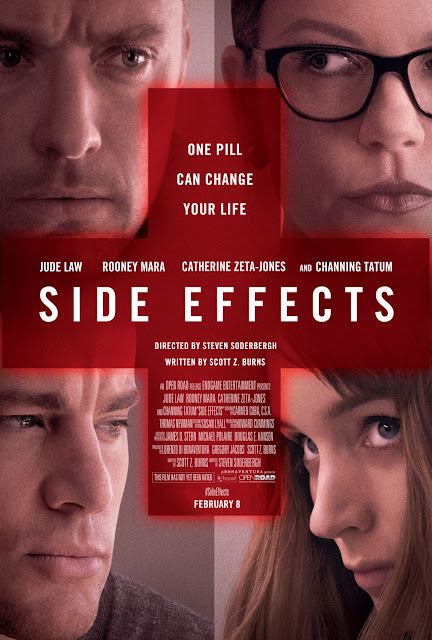 Soderbergh's intense study of the medical field yields an impressive cinematic work in Side Effects. This is a dead-serious film about medical complications, one that swallows with ridicule yet sustains its fundamental eeriness and gravity throughout. The intensity of previous Soderbergh films is in full force here. The film brings horror home to a substance that most grownup moviegoer actually take. The screws are tightened expertly in this suspenseful meller about a flipped-out drugee who makes life hell for the married man who medically advises her. Solid direction, thrilling set pieces, and a riveting performance from Rooney Mara. It's a bleak film, but an extremely watchable one. The entertainment value for this one is high. A pure film for adults, and it manages to walk a tightrope between reprehensible behavior and business as usual. An exceptionally well-written, well-acted and well-directed thriller that extends beyond the boundaries mainstream films typically set. Overall, it is a worthy final chapter to a great cinematic career. Also, see my review for Contagion. 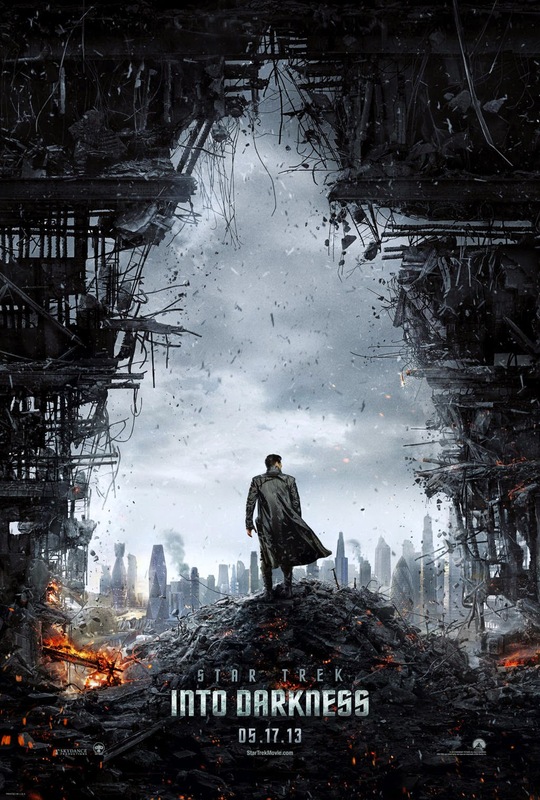 Film Review: "Star Trek Into Darkness" (2013). "You think you world is safe? It is an illusion. A comforting lie told to protect you. Enjoy these final moments of peace. For I have returned to have my vengeance. So, shall we begin?" This is what is going down in Star Trek Into Darkness. This science fiction action film directed by J. J. Abrams and written by Roberto Orci, Alex Kurtzman, and Damon Lindelof, based on the series of the same name created by Gene Roddenberry. It is the twelfth Star Trek film and serves as the sequel to 2009's Star Trek. When the crew of the Enterprise is called back home, they find an unstoppable force of terror, from within their own organization, leaving our world in a state of crisis. With a personal score to settle, Captain Kirk leads a manhunt to a war-zone world to capture a one man weapon of mass destruction. In June 2008, it was reported that Paramount Pictures was interested in signing the main producers of the 2009 Star Trek film for a sequel. Screenwriters Kurtzman and Orci began writing the script in June 2009. By 2010, a release date of June 29, 2012, was set, with Damon Lindelof announcing he had begun working on the script with Kurtzman and Orci. Pre-production was set for a January 2011 start. Abrams, Kurtzman, and Orci stated that selecting a villain was hard. In January 2011, Abrams reported that he had not decided whether or not he was directing the sequel, citing that he had still not seen a script. In February, Orci posted on his Twitter that he (and Lindelof and Kurtzman) aimed to deliver the script in March 2011. By April, Orci revealed at WonderCon that the film's first draft of the script had been completed. Abrams reported to MTV that once he finished work on his film Super 8 (2011), he would be turning his full attention to the Trek sequel. Though a script was completed, uncertainty regarding the extent of Abrams' involvement led to the film being pushed back six months from its June 2012 release date. In September, Abrams officially signed on to direct the film, with the cast from the previous film reprising their respective roles. The film was given a revised release date and pushed to a 2013 slot. Originally actor Benicio del Toro had reportedly been sought for the role of the villain. He later bowed out. Actress Alice Eve has signed on for a role and so has Peter Weller. In January 2012, it was reported by Variety that Benedict Cumberbatch has been cast in the role of the villain in the film. Chris Pine reprises his role as Captain James T. Kirk, with Zachary Quinto, Simon Pegg, Zoe Saldana, Karl Urban, John Cho, Leonard Nimoy, Anton Yelchin, and Bruce Greenwood reprising their roles from the previous film. Benedict Cumberbatch, Peter Weller, and Alice Eve round out the film's principal cast. Pine gave an emotional performance as Captain James T. Kirk. Quinto gave another brilliantly portrayed and intelligent performance as Commander Spock. Cumberbatch gave the film's strongest performance as John Harrison. Dark, sinister, but ultimately even more involving than its predecessor, Star Trek Into Darkness defies viewer expectations and takes the series to heightened emotional levels. Despite flaws and plot holes in the story, the film is a great technological achievement in the Star Trek franchise.